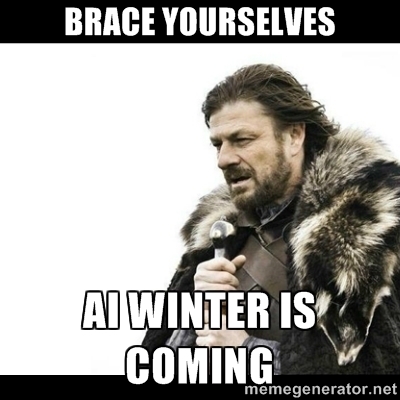 I only attended NIPS for the Conversation AI workshop, so my thoughts are limited to that. I really liked the subtitle of the workshop: "today's practice and tomorrow's potential." Since I'm on a product team trying to build chatbots that are actually effective, it struck me as exactly the right tone. Several presentations were related to the Alexa prize. When reading these papers, keep in mind that contestants were subject to extreme sample complexity constraints. Semifinalists had circa 500 on-policy dialogs and finalists less than 10 times more. This is because 1) the Alexa chat function is not the primary purpose of the device so not all end users participated and 2) they had to distribute the chats to all contestants. The result of sample complexity constraints is a “bias against variance”, as I've discussed before. In the Alexa prize, that meant the winners had the architecture of “learned mixture over mostly hand-specified substrategies.” In other words, the (scarce) on-policy data was limited to adjusting the mixture weights. (The MILA team had substrategies that were trained unsupervised on forum data, but it looks like the other substrategies were providing most of the benefit.) Sample complexity constraints are pervasive in dialog, but nonetheless the conditions of the contest were more extreme than what I encounter in practice so if you find yourself with more on-policy data consider more aggressive usage. Speaking of sample complexity constraints, we have found pre-training representations on MT tasks a la CoVE is extremely effective in practice for multiple tasks. We are now playing with ELMo-style pre-training using language modeling as the pre-training task (very promising: no parallel corpus needed!). Another sample complexity related theme I noticed at the workshop was the use of functional role dynamics. Roughly speaking, this is modeling the structure of the dialog independent of the topic. Once topics are abstracted, the sample complexity of learning what are reasonably structured conversations seems low. Didericksen et. al. combined a purely structural L1 model with a simple topically-sensitive L2 (tf-idf) to build a retrieval based dialog simulator. Analogously for their Alexa prize submission, Serban et. al. learned a dialog simulator from observational data which utilized only functional role and sentiment information and then applied Q-learning: this was more effective than off-policy reinforce with respect to some metrics. Overall the workshop gave me enough optimism to continue plugging away despite the underwhelming performance of current dialog systems. I've been integrating reinforcement learning into an actual product for the last 6 months, and therefore I'm developing an appreciation for what are likely to be common problems. In particular, I'm now sold on the idea of reinforcement learning as a service, of which the decision service from MSR-NY is an early example (limited to contextual bandits at the moment, but incorporating key system insights). Service, not algorithm Supervised learning is essentially observational: some data has been collected and subsequently algorithms are run on it. (Online supervised learning doesn't necessarily work this way, but mostly online techniques have been used for computational reasons after data collection.) In contrast, counterfactual learning is very difficult do to observationally. Diverse fields such as economics, political science, and epidemiology all attempt to make counterfactual conclusions using observational data, essentially because this is the only data available (at an affordable cost). When testing a new medicine, however, the standard is to run a controlled experiment, because with control over the data collection more complicated conclusions can be made with higher confidence. Bootstrapping is everything It is amazing how clarifying it is to try and solve and actual problem. I now appreciate that reinforcement learning has been oversold a bit. In particular, the sample complexity requirements for reinforcement learning are quite high. (That's fancy talk for saying it takes a lot of data to converge.) When you are working in a simulated environment that's not such a concern, because you have the equivalent of infinite training data, so we see dramatic results in simulated environments. When reinforcement learning is done on live traffic with real users, you have less data than you think because you always start with a test fraction of data and you don't get more until you are better (catch 22). So I actually spend a lot of my time developing initial serving policies, unfortunately somewhat idiosyncratically: imitation learning can be great with the right data assets, but heuristic strategies are also important. I suspect initialization via not-smartly-initialized-RL in a simulated environment is another possibility (in dialog simulators aren't so good so I haven't leveraged this strategy yet). This creates some design questions for RL as a service. Assuming there is an initial serving policy, how do I specify it? In the decision service you pass in the action that the initial serving policy would take which is fine for contextual bandits, but for a multi-step epoch this could be cumbersome because the initial serving policy needs to maintain state. It would make sense for the service to make it easier to manage this. An arbritrary program (``heuristic''). Sometimes this is the easiest way to cold start, or this might be the current ``champion'' system. Imitation learning. Assumes suitable data assets are available. Off-policy learning from historical data. This can be better than imitation learning if the historical policy was suitably randomized (e.g., the exhaust of previous invocations of RL as a service). Boostrapping via simulation. In dialog this doesn't seem viable, but if a good simulator is available (e.g., robotics and game engines? ), this could be great. Furthermore this would involve direct reuse of the platform, albeit on generated data. Language is the UI of programming I think ideas from credit-assignment compilation would not only address the question of how to specify the initial policy, but also provide the most natural interface for utilizing RL a service. I'll do another post exploring that.